After the recent rainfall I thought I'd wander along Cradle Lane today to see whether it had been damaged by horses or motorcycles. It hadn't but it was impassable at its southern end as you can see from this image. 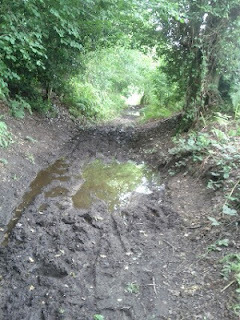 Yes the mud is way over ankle deep, occupies the full width of the track and extends for several hundred yards. I could take an offroad motorcycle along the track and I'm sure that some horses could be persuaded to get their feet wet by a strong rider but on foot you'd need waders. No change then in the last 100 years or so despite spending vast amounts of public money making the ford and northern section suitable for motorised traffic shortly before banning most motorised traffic. Despite this being the height of summer Cradle Lane is little more than an expensive dead end for the hordes of city dwellers who were to be encouraged to bring their wheelchairs, prams and mobility scooters along the almost paved path; they won't get further south than the river until the next drought or when hell (and Cradle Lane) freezes over.